H. 54 in, W. 45 in. Ink monochrome painting using wash was first practiced in China during the Song period (960-1279). Trade between Japan and China was reopened during the 12th century. This resumption meant that Chinese paintings could be imported into Japan. The first ink paintings were religious, used in meditation and ritual practices by Zen Buddhist monks. 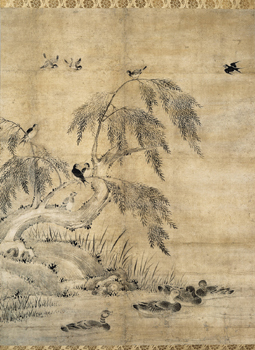 The techniques and themes of ink painting spread from the Zen monasteries to the studios of professional painters. The painter was probably a member of the Kano school, the hereditary family of painters employed by the Tokugawa shoguns and other military rulers from the 16th to the 19th centuries. Kano painters combined the Chinese style ink painting with Japanese sensibility. They developed a style of large scale painting suited to the need for the large scale interior decoration demanded by their wealthy patrons. The sharply defined details are typical of the art of the Kano school and they distinguish it from the softer, more atmospheric Chinese models. A willow tree sits on the bank of a body of water. Its trunk is thick, gnarled, and bent with age. The branches, with fully developed leaves, hang over the water. We can tell that this is water because a group of ducks are swimming under the branches. Birds perch on the tree, while still others fly overhead. Nature has been carefully and intimately observed. Each type of bird is represented differently. On the shore we can see tall grass growing on gently rolling hills or rocks. All of this indicates that it is a summer landscape. In Japan ink monochrome landscapes were often used for interior decoration in the form of screens or sliding doors in monasteries as well as residences. They were, in fact, part of the architectural tradition in Japan, a utilitarian feature of Japanese buildings used to separate and define space. Originally the painting consisted of two panels from a sliding door. The two panels are now joined and mounted as a hanging scroll. The scene is painted with ink and washes of ink and gold. The artist has varied the shape, size, and tone of his brush strokes to create his effects. Notice how he has used strong outlines and ink wash.